Are your teeth misaligned, but you don’t want to deal with the inconvenience of traditional brackets and wires? Do you wish for a comfortable, convenient, and highly discreet orthodontic option? If you qualify, then Invisalign® clear aligners may be the answer you’re looking for. Invisalign® is an advanced orthodontic system of clear, custom-designed acrylic aligners. Unlike traditional braces, which rely on brackets and wires to provide necessary tension, Invisalign® relies on the unique and innovative design of its custom-made aligners. Each aligner is designed to move crooked teeth a certain degree, and as you progress through the series, they’ll gently but continuously correct your tooth misalignment. The clear aligners are virtually invisible, helping you remain confident even as you undergo orthodontic treatment. Invisalign® aligners are temporarily removable, so you don’t have to worry about your favorite foods being caught in your braces. 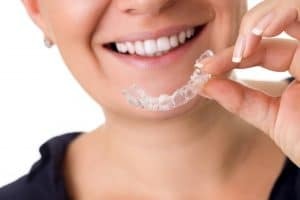 Removing your aligners temporarily also allows you to brush and floss your teeth consistently and effectively, reducing your risks of developing cavities, gum disease, and more. By straightening your teeth with Invisalign®, you can also enjoy improved long-term oral health, a better and more balanced bite, and a significantly more confident smile. While Invisalign® clear aligners are simpler and more convenient than traditional braces, they follow the same principles of gentle orthodontic tooth movement as braces. If you want a more convenient, comfortable, and cosmetically appealing alternative to braces, then you Invisalign® treatment may be right for you. To find out, schedule a consultation by calling the Lathrop Dental Center in Katy, TX, today at 832-437-3849.